A shell is a hard thing to break. They exist to block the world out, and to give a sense of safety. The shell can be comfortable, warm, and secure. But shells are not meant to be permanent. They are meant to be broken. I remember very plainly the shell I had put myself in when I began high school. I was me, and the world was outside. I had no reason to abandon my cocoon of protection. That is, I had no reason until I truly met the people of Mound Westonka High School. When I began to pay attention to the people around me, I was surprised at the wide range of acceptance demonstrated. All walks of life came together inside of that building. There were still semblances of the high school stereotypes; labels were prevalent, cliques did exist, and everyone seemed to have an air of angst, but these barriers were easily breached. We could sit at the lunch table and heatedly discuss current political trends, any sort of competition, or even religion, and afterwords smile amicably at each other. There were no limitations to which group you could feel comfortable around. Track stars and football players found common ground with the band and choir geeks. A lot of them were in all four categories. The breadth and depth of character exhibited by any number of my peers could easily rival that of people four times their age. Perhaps I am viewing the past in a gilded light. Maybe my experiences aren't indicative of the norm. But I do know that the people I met during my brief time in Mound Westonka High School are some of the best people I could ever hope to meet. My primary reason for being proud to have graduated from Mound Westonka is the work that faculty and staff do beyond what is required and the opportunity for academic success and personal growth this produces in students. Through incentive assemblies and opportunities such as the Westonka Summer Institute they recognize students who are flourishing in the classroom as well as develop students for life outside the class. I was fortunate enough to be able to participate in the Westonka Summer Institute in China. Each of these events could not be completed without the commitment and hard work of the faculty and staff at MWHS. The highlight of my senior year of high school (2011-2012) happened in October. 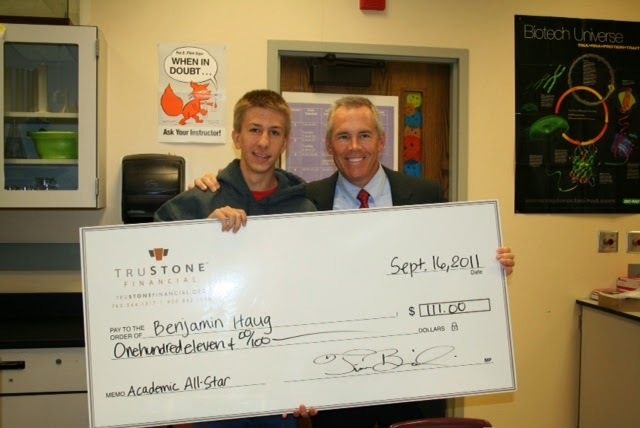 I was recognized as a “KARE 11 Academic All-star”. To this day, I do not know who nominated me for this award, and I am perfectly okay with this. So many of the teachers go above and beyond what is needed and care not only about my learning their subject matter, but also about my personal growth as a human! I want to thank all the staff for instilling in me a love of learning as well as preparing me for what lies ahead in life.